We were pushing back, and we were finding light, and we were holding on to be the last ones. PYYRAMIDS is the dark and mysterious union of two beautifully creative minds joined together from great distance. Improbably comprised of Tim Nordwind and Drea Smith – he from the indie rock band OK Go, she from the electro-pop outfit He Say/She Say – the duo initially bonded over an affinity for first-wave British post-punk and 80’s Manchester bands. “We were an unlikely combination, and that seemed like reason enough to try it,” Nordwind explains. After a mutual friend introduced the pair via email, a dialogue started and a fast friendship was forged…the musical ideas began to flow back and forth via email. “We didn’t have any specific goal, we just started writing and these songs emerged,” elaborates Smith. In 2011 PYYRAMIDS released their first EP, Human Beings, on independent label Paracadute. The 6-song EP gained traction in the underground with savvy music bloggers from across the globe championing the band. Videos for tracks “That Ain’t Right” and “Don’t Go” garnered online attention and warmed hearts, igniting the imagination with a kaleidoscopic wonderland of saturated color and a cheeky playfulness tinged with haunted mystery. Following these successful shows, the band wrote and recorded the tracks that were fated to become the band’s full-length debut album, Brightest Darkest Day out on Paracadute on April 9. Made in Nordwind’s basement studio, with the final tracks recorded at Dan Konopka of OK Go’s studio, the full-length gives a nod to their EP while moving forward into PYYRAMIDS’ next phase of evolution. “There’s a pop sensibility to the album that’s bright but the sound and delivery is dark,” offers Smith. “Don’t Go,” a holdover from the Human Beings EP, is a perfect example of this bright pop-sensibility infused with darkness, as Smith croons to her jilted (ex) lover over a bouncing bass-line and angular guitar assaults that are stuck somewhere between the dance-floor and the arena. 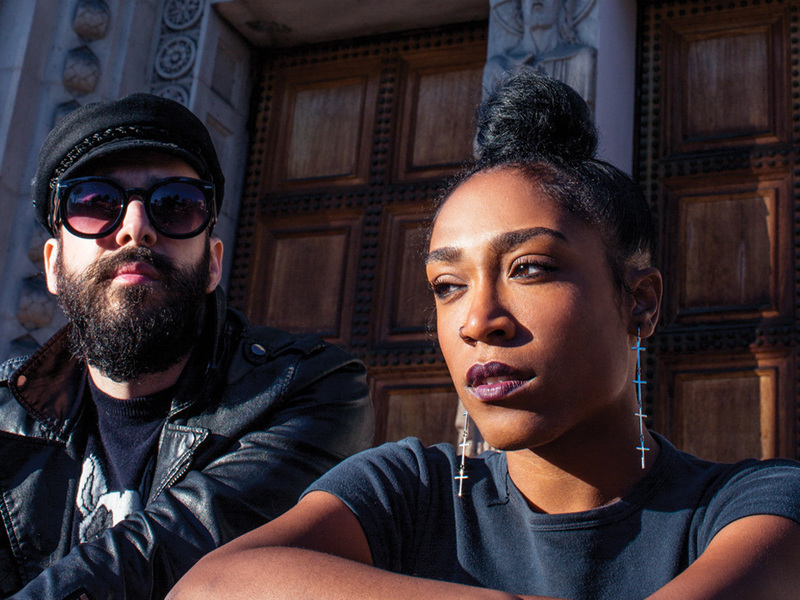 Nordwind describes the album’s mood and lyrical themes as the struggle for happiness, of “trying to ride the delicate balance” of being in an intimate relationship. “Nothing I Can Say” conjures this struggle, reflecting on challenges of connection in a symbolic manner, shrouding Smith’s vocals in psychedelic haze and tearing the song’s sound apart at the seams so that it sounds as if it could fall apart at any moment, stretching it out like taffy to build tension and yet never providing an easy answer to the difficult questions posed in Smith’s lyrics. “Is there nothing I can say? / Is there nothing I can do?” repeated over and over captures the desperation of what some relationships can bring. “[It’s about] the madness that can come from trying to communicate with someone that you love who is having a hard time communicating back to you,” says Nordwind. Mixed by Dave Fridmann (Flaming Lips, MGMT), and Dan Konopka of OK Go, Brightest Darkest Day finds PYYRAMIDS venturing into fresh territory. Experimenting with sonic landscapes on the album’s title track, Nordwind takes a hypnotic drum loop and adds icy synths, a bass-line that bubbles up from the depths, and haunting strings, all adding up to something that wouldn’t seem out of place on a Gorillaz record. This is a darker vision of pop that intersects at the drugged-out clubs at 2 am and the hidden alleyways of the imagination.